If you hear squealing noises, the steering wheel feels stiff, or find damage on the power steering belt, have the power steering pump replaced. A whining noise while turning the wheel of your vehicle indicates something wrong with your power steering system. It could be a leak in the power steering pump or the fluid level could be low. If the power steering fluid level remains this way for too long it can damage the whole power steering system. Either way, the power steering pump needs to be looked at and potentially replaced by a professional. While turning a corner, if your steering feels slow to respond to the steering wheel inputs you are making, chances are your power steering pump is failing, especially if accompanied by a whining noise. The steering wheel may also feel stiff when turning — another indication of a power steering pump failure. Steering issues frequently require a replacement power steering pump. 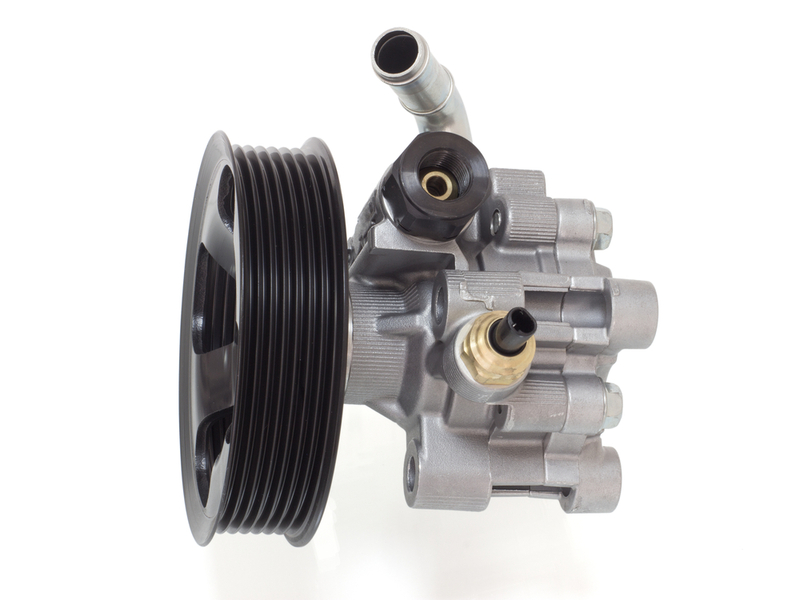 A faulty power steering pump can also contribute to squealing noises when starting the vehicle. Though they may also occur during sharp turns, you are more likely to hear them for a minute when your car first starts. If it seems like it’s coming from the hood of your vehicle, it’s a sign of a failing power steering pump causing the belt to slip. Groaning noises are a sign of a lack of fluid in the power steering system and can eventually damage the whole system, including the steering rack and lines. They will get increasingly worse as your power steering pump continues to fail and could lead to a complete power steering system replacement. Though it could also be from the lines, hoses, and other steering gears, the power steering pump could be leaking from a crack in the pump housing or reservoir. A red or red-brown puddle beneath your car points toward the power steering pump. The pump will need diagnosis by a mechanic and most-likely replacement. As soon as you notice unusual noises coming from your vehicle or the steering is stiff or slow to respond, have your power steering pump inspected, and if needed replaced. Power steering is an essential part of your vehicle and is a safety issue, so it should be taken care of by a professional as soon as possible.